As the weather heat ups and school winds down, there may be more time to take on activities that will keep kids – and their parents – active, interested and entertained. Although hopefully there will still be plenty of laying around and downtime, kids can also try activities that avoid the typical “I’m bored” summertime complaints. In this six-part weekly blog series, a different summer activity will be featured each week – all of which can be tailored to your child’s age, interests and capabilities. So spring into summer with a bang and try an activity that you and your kids can enjoy together. For starters, how about some summertime astronomy? To kick off the series, we’ll start with an activity that combines science and summer nights spent outdoors: astronomy. Two of the best things about the summer season are the warmer evenings and the clearer night skies. Although nights are shorter, there are astronomy sights that are actually better to spot than in any other season. You often don’t need expensive equipment, depending on how much you want to observe; a pair of binoculars or sometimes even the naked eye will do. In particular, your child can have a wonderful view in the summer of the Milky Way. This galaxy is actually best viewed on clear and moonless nights. The Milky Way’s stretch of stars extends from the northeastern to southeastern horizon and is made up of young, blue stars as well as the older, red stars. Summertime astronomy is also a great time to observe the Summer Triangle. The three 1st-magnitude stars are the Vega, which is the brightest star in the eastern sky; Deneb, a bright star located to the lower left of Vega; and Altair, which is the farthest south of the stars. The Milky Way passes through the Summer Triangle, between Vega and Altair. Your child can also spend summer evenings learning about the basic constellations, such as Aquila the Eagle, Sagittarius the Archer and Scorpius the Scorpion. Another great summertime astronomy highlight is watching the Perseid meteor shower. Be warned, however, you and your child will have to stay up late, as the meteors are typically best observed between 2 and 4 a.m. This year, it will peak on the night of August 11 and the morning of August 12. This wait is well worth it to watch these very fast and bright meteors – Perseid meteor showers are thought of as one of the best of the year for the Northern Hemisphere. This meteor shower is easily observed, as long as you’re in a dark location. In addition to these nighttime observations, your child can visit space centers, planetariums and children’s museums. Another fun activity starts with your child signing up for International Space Station (ISS) “Spot the Station” free email alerts (go to http://spotthestation.nasa.gov/). Then they will receive an email a few hours before the ISS goes over their house. At the designated time, they can go outdoors and look for a very bright light, the ISS, moving across the night sky. 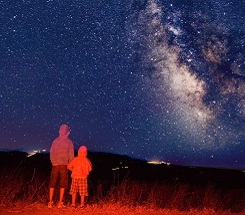 The summertime astronomy activities can be as in-depth or simple as you’d like — even lying under the stars with your child under a summer night sky is a wonderful astronomy experience.